Transcript and Original "Statement of Heng Peov"
The following is a transcript of the statement issued anonymously under the name of Heng Pov. Until 27 July 2006, I was the Major General of Ministry of Interior’s Under Secretary of State, and Personal Advisor to Prime Minister Hun Sen. At the same time I retained the position of the Police Commissioner of Phnom Penh until January 2006, a position that he had held since 2001. On 27 July 2006 whilst I was overseas, my Prime Minister appealed to King Sihamoni to remove me from my position and the King signed the agreement. I am now in hiding in a neighbouring country and cannot go back to my beloved country Cambodia. My Government has been mounting a propaganda campaign against me since I left Cambodia on 23 July 2006. I have been portrayed by the Cambodian media as a villain and a criminal. My family in Cambodia including my wife who is recovering from cancer and my two year old American born son Pov Justin have been placed under house arrest. They have searched my two houses and confiscated my assets. Most of my staff members have been arrested on trumped up charges. An International Warrant has also been issued for my arrest. I think it is time to tell the world my story and hopefully by so doing I can clear my already muddied name. I am nothing like what I have been accused of and I have never committed the crimes that they have alleged. I wish to declare to the whole world my innocence. This document is my only means to get my message crossed. I believe that it was my consistent efforts to eradicate the rampant corruption in Cambodia, my support for the transformation of Cambodia into a democratic society and my position against systemic human rights violations in the country which has resulted in the precarious circumstances I have found myself in. I do not regret what I have done. If I have to die for my beliefs and my country I stand ready and willing to do so. I was born in Kandal Province on 1 December 1957 and both of my parents were rice farmers. My parents passed away when I was the age of 11. In 1992, when I was on duty as a police officer in the Anti-Crime Squad in Phnom Penh, I suffered a gunshot injury to my left leg which resulted in my leg being amputated. I lost my left leg for my country. In 1995, there were wide- spread demonstrations in Cambodia led by Sene Sane for democracy. The Prime Minister Hun Sen ordered to that these demonstrations be quashed. He called for a meeting with Hoc Lundy, General Director of the Police Force. I was invited by Hoc Lundy to the meeting as his friend. (I recall Amson An, Secretary of State of Ministry of Interiors was also at the meeting. The meeting was held at the Prime Minister's residence at Tourle Krarsing, Kandal Province.) At that time, I was the chief of Bureau of Anti Narcotic in Phnom Penh. At the meeting, I heard them saying to do whatever possible to bring to an end the nationwide unrests. I did not know that he would use the grenades at the demonstrators. The grenades killed over 10 people at the Pagoda. Sene Sane's son was injured by the grenades including 10 other people. I did not know that they would be using the hand grenades against the innocent demonstrators. I was not a party to it. When the grenades exploded, I was at the office of Net Sa Veun talking to him about how Hun Sen had met Hoc Lundy. After that the police were alerted to the explosions and that is when I knew that something bad happened. I only found out that after the grenades exploded. The police were called upon to investigate who was responsible for the bombing, but they did the investigation superficially and were trying to cover the track than to find the person responsible. During my time at the Anti-Narcotic Bureau, I discovered evidence showing Hun Sen's people being involved in drug trafficking. I went to see Hun Sen with a view to bringing it to his attention. He took me to the cellar of his house which was nicely decorated. Hun Sen asked me whether I knew the names of the people who were into the drugs. I replied that I knew and I told him one name Mon Routy whom I was sure was involved. I suspected other men of Hun Sen were also involved, but I was not 100% sure. Hun Sen did not make any comments. Then Hoc Lundy then arrived with Huy Piseth, Chief of the Hun Sen's bodyguards and distracted my discussion with him. We then talked about the opposition party's protest. Hoc Lundy said to Hun Sen, ' why don't you use hand grenades.' Hun Sen said that it was a good idea... "I can send Seth to do it and he is a good operator." He authorized Hoc Lundy to pay for Huy PiSeth to do the job. Hoc Lundy answered that he would put together the money to pay them. He suggested that I met with Seth. After that, Hoc Lundy ordered me to find the money (US$ 100000) to give to Huy Piseth. The money came from the police. On 30/3/97, the opposition leader Sam Rainsy led a demonstration calling for the reform of the justice system in Cambodia. The demonstration was held in front of the Assembly of the Nation. I was near the Pro Tom Pagoda and witnessed what happened. My staff took me on his motorbike to see the big protest outside the Assembly. 2-4 minutes after we arrived, I heard a big explosion and people crying and screaming. Then I saw four men running away from the scene. I recognized only two of them that were: Mr Phan Sary Colonel and Mr Ourn Cham Nane Commander; both of them were Hun Sen's men. I did not know the other two. They ran towards the Prime Minister' house. I followed them there to see what they ran away like that for. I talked to General Huy Pheseth and told him that I saw four of his people running away from the scene and that they should not have thrown the grenades. He told me to keep quiet and don't talk to any body. But I was angry and upset. I need to speak to somebody about it. I went to see Hoc Lundy who I considered at the time as my friend. I felt that I had to report to Hoc and could not understand why Hun Sen chose to kill so many people. But he told me the same thing to keep quiet and not to tell anybody about it. Amongst the people who were killed or injured was an American. I understand the American Government sent people to Cambodia to investigate. In 2003 Phan Sary came to see me in my office. He admitted to me that he was the person who threw the grenades. He said that he was very sad because he killed so many people. He complained that Hun Sen used to pay him money to have things done. When he was in trouble nobody seemed to care about him He said that he did what he did because Hun Sen ordered him and he had to please him. He acknowledged that he killed a lot of people before. He said that he now did not even have money to support his children. I recorded the conversation. In 1997, I was the director of anti-narcotic bureau. I seized seven tons of marihuana belonging to Mon Rati's company. Mon Rati was a close friend of Hun Sen. The marihuana was hidden away in two containers and were ready to be shipped to Norway. The seizure occurred at a border port of Siha Nauk Vill, after the seizure, Mr. Ho Sok, the undersecretary of the Ministry of Interior from the Funcinpec Party asked me to arrest Mon Rati. I could not do it as Mon Rati was associated with Hun Sen and he intervened. Hun Sen announced in the media that if Mon Rati was arrested, he would make sure that Mon Rati would not be touched. I therefore could not do anything about it. After that, the Canadian Embassy invited me to go to Canada to brief the Canadian government on the seizure. The Hun Sen was very angry with Ho Sok. Before I was scheduled to leave for Canada, Hun Sen called me to his residence and asked me to consider not to go to Canada. He asked me to tell the Canadian that I was busy and could not accept the invitation. The story of the seizure became bigger than what it was supposed to be because it involved Hun Sen's people. Hun Sen openly vowed to protect Mon Rati. Hun Sen said that if I were to tell the Canadian about the drug seizure, the international community would exert pressure on the Cambodian Government. He suggested that I stay calm and keep quiet. If I did what he told me to do, I would be given a new car by Mon Rati. Mon Rati then paid me a visit shortly after my meeting with the Prime Minister. Hun Sen also asked me to give a press conference denying the seizure ever occurred and to cover it up. Shortly after the above incident, there was a coup d'etat in July 1997 led by Hun Sen to outlaw the Funcinpec Party. Mr. Ho Sok went to the Singapore Embassy in Phnom Penh for asylum because Hun Sen and Hoc Lundy were trying to arrest him as he was from the Funcipec Party. The asylum was refused and Ho Sok was turned away. Hoc Lundy then apprehended him and ordered his bodyguards to take him to General Ma Seun's office of the PPC. Hoc Lundy then gave me direct order to take Ho Sok to my office. When I arrived there, there were 6 armed men sent by Hoc Lundy waiting for me. I knew the two of them and they were Keov Vichet and Bon Na . They shot Ho Sok outside Ma Seun's office. I questioned them as to the killing. Bon Na replied that Hoc Lundy sent them to kill Ho Sok then and there. Hoc Lundy did not like Ho Sok. I was shocked and rang Hoc Lundy who said that if Ho Sok was alive he would create a lot of trouble for us. He asked me to give Bon Na a car from the police vehicle pool as his reward. I did what I was told and gave Bon Na a Camry 97. In 1999, I was heading the Anti- Crime Bureau as deputy director and was in charge of the investigation of the death of the movie star. I found that before she died, she had an affair with Hoc Lundy. Her husband went overseas frequently, leaving her alone in Cambodia. Hoc Lundy often contacted her and took her to parties and buying her presents etc. In due course, a relationship was developed and she bore a son for Hoc Lundy. Then Hoc Lundy introduced her to Hun Sen. Hun Sen met her. Prior to her meeting Hun Sen, she was not that well off. But afterwards, she made a lot of money. Her bank account in Canada Bank showed a balance of US$30,000 at the time of her death. She was also given a brand new Honda CRV and a villa. She was worried about her safety everyday as Hun Sen's wife found out their secret affairs. Hun Sen's wife blamed Hoc Lundy as he was the matchmaker. Hoc Lundy made peace with her and promised that he would try to separate the movie star from Hun Sen. Soon the movie star was killed. I found out that the killer was one of Hoc Lundy's body guards. I went to question Bon Na and he admitted that he was involved together with Keov Vichet in the killing under the order of Hoc Lundy. Because the crime involved Hoc Lundy, I could do nothing about it. I made no arrest. I was very upset and there an innocent life killed and I being a police officer could do nothing. In 2000, I got in touch with the opposition parties. I did this because I believed that the Hun Sen government was corrupted and that if there was any hope for Cambodia, it would be through the opposition parties. He had too much blood on his hands having killed too many people. I would like to see a change in the Cambodian Government to bring democracy and Justice to Cambodia. When I heard Hoc Lundy and Hun Sen were conspiring to kill them. I went to alert the opposition leaders in secret by contacting people closer to them and to warn them. I suggested to them joining forces to get a better chance to be elected in the next election in 2008. I also gave some evidence showing how corrupted Hun Sen was to the opposition leaders so that they may expose it to the public. In late June/July 2006, Hun Sen found out that I was speaking to the opposition giving them suggestions etc. He was not happy with me. He accused me of being not loyal to the PPC. On 23 July, I left Cambodia to Malaysia to have my leg checked and then to Singapore to see my sons and get a prescription glass done by a friend. Before I left, I asked for permission to go overseas and they granted the permission. On 28 July, I heard from Cambodia and friends that I could not go back anymore because Hun Sen was angry with me accusing me of being a traitor to the PPC. They were trumping up charges against me. I know his real reasons for my arrest. I know too much about him and about his illegal activities. He saw me as a threat to him and wanted to get rid of me. With all that I found out about Hun Sen and Hoc Lundy, I was in despair. I was like a lost ship in a vast ocean. I have my principles and ideals but in a corrupted world, I was going nowhere. To survive, I have to keep my eyes closed to many evils that I have witnessed. It was killing me inside. On three separate occasions between 1999, 2000 and 2001, I decided to talk to the Human Rights Watch in Cambodia . I spoke to Ms. Pon Chigate(PHON), Director of the LICADO in Cambodia, Eva of Global Witness in Phnom Penh, Henrick, former UNHCR representative in Phnom Penh, Christopher Peschoux, UNHCR in Geneva, Mr. Paul Grover of the US Anti-Drug Intelligence Service and finally Naly of the LICADO in Cambodia. I read in the foreign press that I have been accused by Hun Sen of being involved in the assassination of Judge Sok Setha Mony. This is a total fabrication on Hun Sen's part to justify his campaign against me. In 2003, the judge was killed by a terrorist group known as the CFF. The military police in Phnom Penh arrested three people suspected of being involved in the assassination. The arrests were coordinated by Colonel Sim Hong, Military police, who headed the investigations. I had nothing to do with the arrest, because it was military police's job. The people arrested are Chun Ched Tra, and Moul Made but I cannot remember the other person's name. I had a great respect for the judge and I had personally known him well. There was no way that I would have arranged for him to be killed. I believe that this is just one of the many trumped up charges they had against me in order to secure my arrest. I know too much and I have treaded on too many toes. In 2003, I obtained information from an anonymous tip that Lt Colonel Ngur Sambath who was a man of General Sao Sokkha (three-star) and general Dom Hak (2 star) was involved in heroine trade. Following investigations, we attend his residence at Toul Kork District, in Phnom Penh and seized 36 kg of Heroine. Lt Colonel was arrested on the spot but Dom Hak who was residing there fled the scene. We attempted to chase after him to arrest him, but Hun Sen stopped us, ordering not to arrest Dom Hak nor to investigate, saying that there was no need to arrest Dom Hak. I had to stop chasing and investigating. Instead of punishing him Hun Sen surprisingly promoted him to three star about one month later. Ngur Sambath was found killed in the prison. Hun Sen told me not to be too harsh on drug trade. Other people witnessed it and they came over to us trying to calm us down. At the beginning of 2005, I requested to my Prime Minister Hun Sen to reform the court and justice system as it was corrupted. Many judges around the country were not happy with me especially the prosecutor OKsa Voth who was known to be the master of corruption. The Prime Minister supported me and he announced in public to reform the country's justice system. People welcomed the move and to commemorate the occasion, they wrote a song in which my name was mentioned. I told them not to as the Prime Minister would not be happy to see my name being promoted too much. Oksa Voth was unhappy with me as he saw the reform would potentially bring to an end what he could do under the current system. In 2005, Hoc Lundy ordered me to kill the Secretary of the State Nut Sa Ann, because Mr Nut Sa Ann had a conflict with Hoc Lundy over a piece of land owned by the police. Hoc Lundy got very angry with him and ordered to arrange for him to be killed. I refused because I respected the man a lot and would not like to see him killed. I had to find an excuse for myself. I explained to Hoc Lundy that Nut Sa Ann had too many bodyguards and it would not be possible. In December 2005, Hoc Lundy had a conflict with me because he wanted me to cut the lock to the residence of a Cambodian American lawyer David Chinava and to conduct a search. The reason for the search was that the lawyer was said to be drunken one day and drove into the Hun Sen. Public Garden. He fled the scene and kept quiet. About 10 days later, the police started investigating and found the car in his house which he had deserted. The house was locked and that's was the reason why I was ordered to cut the lock to gain access. I did not obey his order and told Hoc Lundy that it was illegal to do that. Hoc Lundy was upset with me for disobeying his order. He shouted at me questioning why amongst all the policemen and women in the country who all respected him, I was the only one who dared to disobey him. He said that he could not tolerate anybody who disrespected him. At the beginning of 2005, Hoc Lundy's son Hock Lundao also known as Dy Vichea was divorced from his wife, Hun Chantah, the niece of Hun Sen.
All of the above incidents where I refused to obey to him made him very bitter against me. He bears grudges against me. On 25 December 2005, he invited the police commissioners, governors and other senior officials of seven Districts to a meeting at the Governor of Phnom Penh's residence. Around 400 people were present. I was one of the participants. Hoc Lundy conveyed his dissatisfaction openly with me and vowed that he would do whatever possible to strip me off my title in three months. He said that he would make this his objective and that if he did not achieve this, he would give up two of his own stars. To me, he declared a public war against me. He said that he was the head of the Mafia in Cambodia and that nobody could win him, 'not even the Advisor to the Prime Minister'. I have a recording of his speech which was given to me by another police friend who was at the meeting. The Cambodian newspaper also reported the meeting. Subsequent to the meeting, I approached the Prime Minister for intervention. The Prime Minister told me not to worry, saying that there would be no way he would let Hoc Lundy remove me from my positions. He said that he himself had issues with Hoc Lundy. I have also been accused of killing a Singaporean man. It is absurd and why did I have to do that? I was certainly not involved in the killing of the Singaporean man, Sim Ping Say. I know him pretty well and regarded him as my friend. Sim was gunned down and killed at the beginning of 2004 . To date nobody had been arrested for the killing. Sim was a Singaporean businessman. He together with another Singaporean Mr. Kok entered into a joint venture with a Cambodian businessman Bun Hy. That was around 10 years ago. The joint venture was to build a hotel with 300 guest rooms. There were problems after problems associated with the building. The three partners eventually ended up not trusting each other. Because of the nature of the project, the Deputy Prime Minister Sao Ka Heng ordered me to intervene and find a solution to their problems. That's how I met Mr. Sim and Mr. Kok. I recall during a meeting I convened for the three of them shortly after my appointment, Mr Kok complained to me about Mr Sim cheating money from him etc. Mr Sim was not present at the meeting. 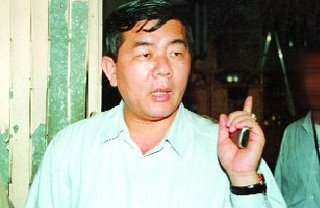 Mr. Kok also said that he was afraid of Mr. Sim because he may arrange for him to be killed and did not want to go back to Cambodia. That meeting was held in Singapore. Prior to the meeting, I met Mr. Kok several times and also received a letter Mr. Kok in Cambodia. Mr. Sim lost a lot of his investment in the project and would like to get out of it by selling the building. He proposed to sell the building and shared the proceeds amongst them. An agreement was reached in the form of memorandum of understanding and was sealed by the government. Because of their mistrust for each other, I was made the agent for the sale and advertised my number as the point of contact for the sale. Offers were received but we were not able to achieve a sale because they kept upper the prices offered. This was partly because after Mr. Sim was killed his wife took control and communicated directly with the other two parties. That situation made it impossible for me to sell the building. This tug of war continued until mid 2004 when I gave it up. I had had enough of their problems, and besides I had too much on my plate at that time.